Last Tuesday my latest trunkshow kicked off at La Casita Yarn Shop Cafe in Brooklyn. I was planning on writing about this weeks ahead to keep you all informed, but alas, suddenly it became so busy in my life that I completely dropped the ball. What can I say... I have been horribly busy knitting other people's designs. Ah, but moving forward now while I am putting my excuses aside! Come have a glass of wine with me at La Casita! My trunkshow in which my designs for Jade Sapphire are being showcased started last Tuesday and will stay at La Casita until coming Tuesday. This Friday September 16, you are invited to come have a glass of wine and nibble on some cheese with me while you peruse my designs. 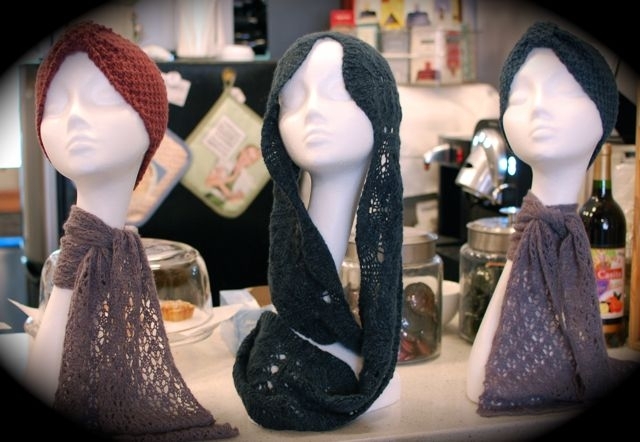 I would love for you to drop by and chit chat about knitting and yarn! And if you ever wondered how it feels to knit with handspun mink/cashmere, I will tel you all about it. 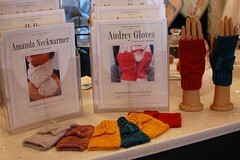 Of course you can touch, feel and try on the knitted items. See you there? I sure do hope so! Submitted by Anonymous on Fri, 10/05/2012 - 17:00. Submitted by Anonymous on Thu, 10/06/2011 - 05:20. Submitted by Nancy Ricci on Sat, 10/08/2011 - 14:59. How beautiful, we traded cities, you now in Pdx and I am in NYC. I love Knitty City, Pearl and everybody at this yarn shop have been so nice to me. NYC is very exciting, but I do miss the Portland knitters!